Hot OFF their performance at the hugely popular Coachella Valley Music & Arts festival, future bass electronic duo B.R.E.E.D. sets sights on India with performances in Bangalore and Mumbai. 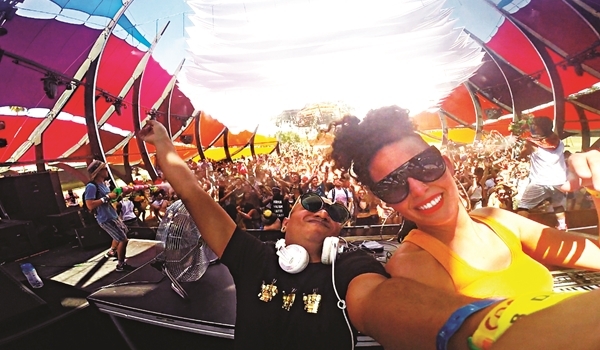 Made up of Ritesh Da��Souza (aka DJ Nasha), one of Asiaa��s most influential and original underground electronic DJ-producers and Tara Mae, a classically-trained pianist and vocalist, it was the first time an Indian-bred artiste (Da��Souza) made it to the line-up at Coachella. We catch up with Mae, who tells us about high-profile gigs, making exotic music and dealing with creative differences. We consider our music to be future bass music layered with a lot of raw vocals and exotic instrumentation like orchestral strings, slightly off-beat percussion and melodic piano and synths. We have always been on the same page, creatively. Thata��s why we connected so well from the start. But occasionally, we may come across a difference in certain sounds. We usually debate it, and then one of us might compromise, but knowing that the other one is not happy with the compromise, we start debating again until we are both happy with the final decision/outcome! Do you make music for yourself or for your listeners? We always make music based on what we are feeling and develop things from there. We do not create music on what anyone else wants to hear, unless ita��s for a specific project or client. Who do you consider important in music right now and why? Artistes like FKA Twigs, James Blake and Flying Lotus are pushing the envelope in music, and are very important in developing new, unique musical sounds that a lot of new artistes worldwide have been inspired by. Leta��s do this! Time to do our thing! It has been the high point so far. Just being able to play most of our new tracks live, by breaking down live vocals and keys has been super fulfilling as thata��s been a goal and this has been developing more and more each day, which is exciting. Especially to have been able to do this at Coachella was amazing. It was a dream come true and the crowd was super high energy, making it even more exhilarating. It was also exciting to be performing alongside major international artistes. We were doing our sound check at the same time when ACDC was doing theirs! First we are super stoked to be releasing our next two-track EP Diamonds into Squares which we are very happy with and excited to a�?unveila�?. We also have a few nice collaborations in the mix, and will also be releasing another EP and some singles later on in the year towards 2016.